Ottawa Humane Society: Fire Prevention Week: What does that mean for your pet? 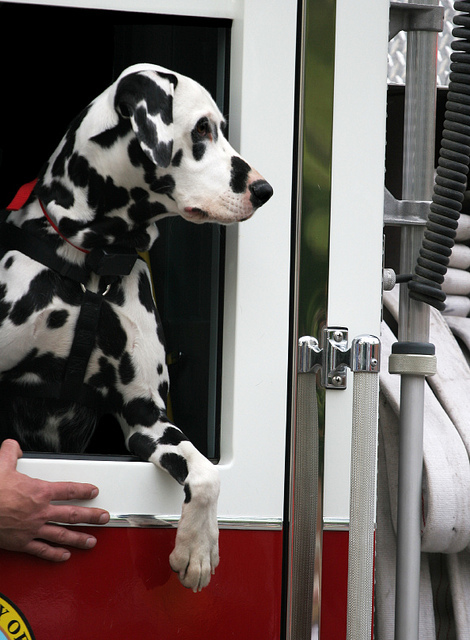 Fire Prevention Week: What does that mean for your pet? October 9 - 15 is Fire Prevention Week - the week to safeguard you, your family and your pets against fire! And what better time to "fire proof" your pets to help prevent a disaster from happening in your home. Never leave a burning candle unsupervised! Even leaving the room for a minute is enough time for a curious cat or a tail-wagging dog to knock over a candle. Make sure that all cords are either inaccessible to your pets, or that you unplug the cords when the electrical device is not in use. Some dogs, cats, rabbits and rodents like to nibble on cords, which can result in serious burns and can cause a fire. Keep certain appliances, such as irons and hair dryers, out of pets' reach. These appliances can produce enough heat that, if knocked over by a pet, they could start a fire. Install a barrier in front of fireplaces, campfires, barbecues and portable heaters. It is a myth that pets are afraid of fire - in fact, many pets like to lay close to a source of heat to stay warm. Lying too close to a fire could result in your pet's fur catching fire; and it is possible for most pets to knock over a portable heater or a barbecue. Always ensure your pets cannot get near these items. If your pet does get burned, put cool water on the burned area quickly, followed by a cold compress, and seek veterinary assistance immediately. Want to let authorities know you have a pet in your home, in case of an emergency? 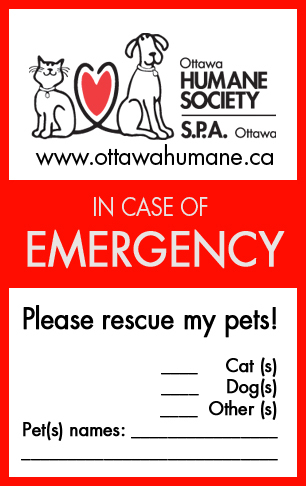 Visit the Ottawa Humane Society at 245 West Hunt Club Road to pick up your window decal to place in a window or door.